Monday morning, I felt like I was having more intense pre-time birthing waves (Hypnobabies word for contractions) but as always I struggle timing my waves and they never seem consistent to me. One will be just pressure feeling, another will be a little more discomfort and I had to use my light-switch in off position (Hypnobabies technique for entering hypnosis). Anyway, after lunch, I finally was like I think this is my birthing time (Hypnobabies word for labor) and I need to start listening to my birthing day tracks. 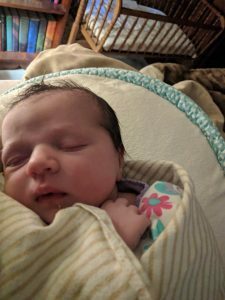 I had my 4-year-old and 1.5-year-old with me at the time and ended up calling my mother in law who was on standby for me to come to pick them up and take care of them for me during my birthing time. So once my kids were gone I began focusing on my hypnosis tracks … I found it a little difficult at times to focus because I was excited and a little scared because some of the waves were already a little uncomfortable. I just knew I needed to really power my mind to focus because I was well prepared for this thanks to my Hypnobabies affirmations, hypnosis tracks and the reading I had done. I first put on my Birthing Time Begins track with the reminders on it, then I got into the bath and listened to Fear Clearing (Hypnobabies hypnosis track to release any fears) and Easy Comfortable Childbirth. I was getting worried though cause some of the waves I was doing well with my hypnosis and other waves I felt more discomfort. It was all about finding a comfortable position for me and once I determined being on all fours or standing up and leaning over, both positions in which I could rock my hips side to side, helped me tremendously actually relax and enjoy the pressure wave. So, if you feel some discomfort in your birthing time keep using your Hypnobabies, it does work but you might need to find a better body position that will help you relax and release more easily. 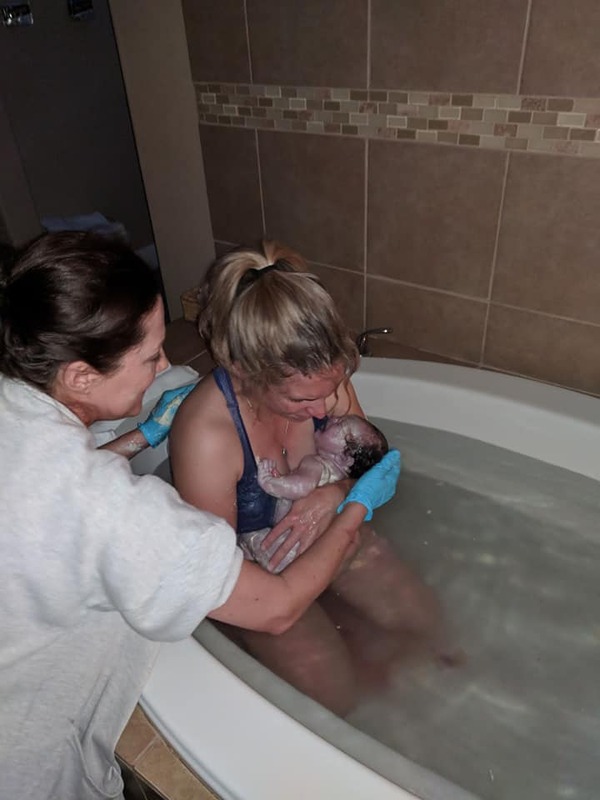 After my bath, I played my Birthing Day Affirmations twice through, once while my husband was packing us up to head to the birth center, the other time in the car on the way down. The affirmations just helped my confidence so much because I did not like having to sit in the car during my waves for the hour car drive to the birthing center. Once we got to the birth center, I played Easy First Stage (Hypnobabies main birthing time hypnosis track) … I don’t even think I ever finished that track. Once my midwife had the bath ready for me I got in and my water broke within just a couple minutes. My next wave I felt that natural bearing down in my bottom and knew my baby was coming so I switched to Pushing Baby Out track (Hypnobabies special hypnosis track for pushing). It took three more waves I think and my baby was out!!! I was in so much shock! It was my easiest most amazing birth by far despite a little discomfort when she actually came out but it was so fast and then it was done and she was on my chest. Amazing! Hypnobabies definitely works if you’ve prepared well and my best advice is like I said earlier keep using your hypnosis if you do feel some discomfort in your waves. 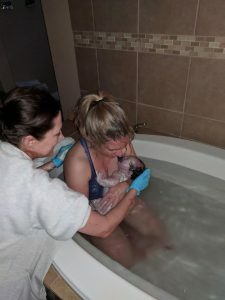 I would try another birthing position and really had to focus my mind on the hypnosis tracks and I repeated over and over my favorite affirmation which was “each wave brings my baby closer to being in my arms”. Also, if you have any feeling that this may be your birthing time start listening to your birthing day tracks right then. I wish I would have called my mother in law sooner to pick up my kids because the early birthing waves were more uncomfortable because it was so hard to focus on my tracks when the kids were there and I just wasn’t convinced it was my birthing time. My birth did happen so fast! She was born just about 40 minutes after getting to the birth center. My midwife told my husband after seeing me that it might be a while until baby came (because I was relaxed and calm I’m guessing) then she checked me and I was an 8 and she was shocked. Also, no purple pushing for me this time, and I remembered to breathe so much better which I know helped my baby have oxygen too. The pushing stage was so natural, it was like a bearing down on my bottom identical to going to the bathroom. And out she came, I didn’t have to quote push at all it was just pressure down there as she came out. The all fours position was the most comfortable to me and that was how I was when she came out. So amazing. Thank you Hypnobabies so much for giving me a much more comfortable birthing experience than either of my other two natural births. And I didn’t wear myself out nearly as much during my birthing time. My recovery has by far been the easiest and I didn’t need one stitch after pushing my baby out.